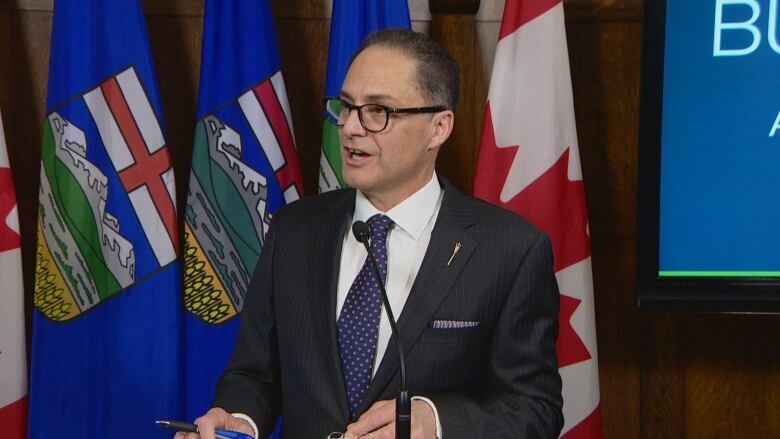 The province's path to a balanced budget doesn't entirely hinge on the construction of three new pipelines, Alberta's finance minister said Friday, but it is based on the assumption that all three will be built. "Trans Mountain is a federally-approved pipeline, and the assumption is it will get built," said Joe Ceci on CBC's Alberta@Noon, adding that expectations of the Line 3 replacement and Keystone XL moving forward were included in the government's predicted revenue for the next five years. "There is a high degree of importance around this and it is my firm belief the federal government will make it happen." Ceci faced a barrage of questions from listeners concerned that predicted pipeline revenue and oil prices were too optimistic, and could lead to an increased deficit that the government would end up pushing forward onto future generations. Kinder Morgan's planned Trans Mountain pipeline expansion has been approved by the federal government, but protesters have held daily demonstrations attempting to stop work from going ahead. TransCanada Corp.'s Keystone XL has also been approved by the U.S. and Canadian governments and has begun construction, but the project has been held up by legal challenges and regulatory delays. Work is underway on Enbridge's Line 3 replacement, but the pipeline has yet to receive construction permits in Manitoba or regulatory permits in the United States. "If we take [pipelines out of the budget] we would have $7 less a barrel for every barrel shipped through Trans Mountain," Ceci said. It would be an estimated $10-billion lift to capital investment over the next five years if the projects go ahead. The government's budget, released Thursday, plans on additional revenue from the Trans Mountain pipeline for supporting what it said are "vital public services" beginning in 2021, and also outlines the importance of the other two pipelines for alleviating bottlenecks, which could shrink the differential between West Texas Intermediate and Western Canadian Select while generating greater revenues. That additional revenue comes from the adoption of the federally-mandated carbon price, which the provincial government has emphasized would be tied to the go-ahead of the Trans Mountain project. It predicts bitumen royalties will jump 34 per cent in 2020-21 when the new pipelines come online, which the government said will be the largest contributor to a $7-billion increase in revenue between 2017-18 and 2020-21. The budget also indicates the addition of Line 3 and Trans Mountain pipelines would lift Alberta's GDP by 1.5 to two per cent by 2023, compared to a scenario without pipelines. "With oil production outstripping pipeline capacity starting this year, prolonged market access issues could lead to a wider differential, weighing on incomes and investment," the budget reads. Ceci wasn't able to provide exact numbers on how much revenue each pipeline was predicted to bring in for the province, but he did say a balanced budget doesn't hinge on the province getting oil and gas to the coast. "The path to balance is not, of course, predicated on these pipelines alone," Ceci said. "The capacity, the growth in oil supplies in this province do not need Trans Mountain to get back to balance." The budget does, however, rely on the prediction that oil will be $59 US a barrel in the 2018-19 fiscal year, $60 US in 2019-20 and $63 US in 2020-21. Ceci said the prediction is based on private sector forecasts. "We don't make these up, we use private sector and use the best information we can," he said. In last year's budget, Alberta overestimated oil and natural gas prices by six per cent. The budget includes a risk adjustment factor of $500 million for this fiscal year, which increases to $1 billion in 2021. "If oil goes below $59 a barrel we have protected ourselves and the budget … we are conservative in the estimations where oil is going to be and natural gas in the differential," Ceci said. The province's total debt is predicted to hit $96 billion by 2023.